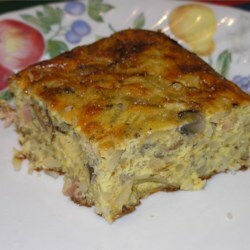 "Hearty meat and potato omelet baked in the oven." Preheat oven to 180 degrees C. Lightly grease an 8x8 inch glass baking dish. Beat eggs in a large bowl; stir in the milk. Stir in the potatoes, ham and cheese. Season to taste and pour into prepared pan. Bake in preheated oven for 45 to 50, until knife inserted in middle comes out clean. Fry bacon over medium high heat until done but not crispy, but still flexible. 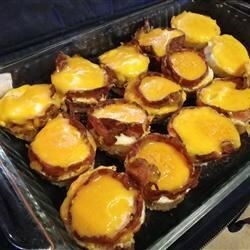 Wrap bacon slice around the inside of a muffin cup. Place a teaspoon of butter (or bacon grease) in the bottom of muffin cup. Drop in egg. Bake in preheated oven for 10 to 15 minutes. 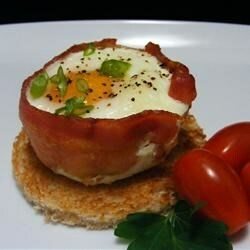 Place 1/4 slice of cheese over egg, and continue cooking until cheese is melted and egg is cooked. This recipe is for 1 serving. Scale it to the number of eggs you would like to bake. You can cook 12 eggs in a muffin pan. If you are doing less, try to space them out in the pan for more even cooking. Cooking times vary in different ovens and at different altitudes; adjust accordingly. In a blender combine eggs, milk, flour, salt and oil. Process until smooth. Cover and refrigerate 1 hour. Heat a skillet over medium-high heat and brush with oil. 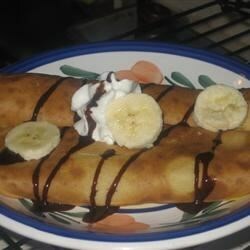 Pour 1/4 cup of crepe batter into pan, tilting to completely coat the surface of the pan. Cook 2 to 5 minutes, turning once, until golden. Repeat with remaining batter. In a shallow bowl, whisk together the eggs, sweetened condensed milk and vanilla with a fork. Set aside. Melt butter in a large skillet over medium heat. 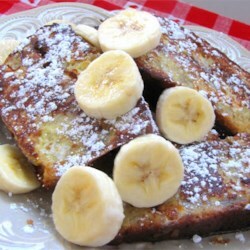 Slice banana bread into 4 thick slices. 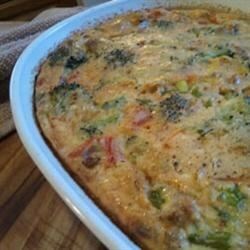 Dip each slice into the egg mixture, then place in the hot pan. Cook on each side until golden brown. Dust with confectioners' sugar just before serving, if desired.